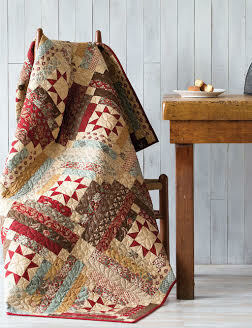 Remember a couple of weeks ago when we told you about Marianne Fons and her Libby’s Log Cabin quilt? (If not, you can read about it here.) Marianne stitched the quilt from Moda’s Collections for a Cause Community line, which is benefitting Libby as she recovers from a stroke. We just wanted to let you know that there is a lucky winner. At the end of the day on February 13, Marianne put the names of all those who contributed funds into a stocking hat and selected Anne Nee of Milwaukee. Congratulations, Anne! I am smitten by this pattern. I will be buying it soon! I really enjoy their TV show and was surprised by the new hairstyles! I must have been watching older shows before!! Congrats to the winner. What a beautiful quilt and a wonderful tribute to this lovely lady. I’m wondering if you can buy the pattern and the same fabric shown here. Congratulations to Anne. And as always prayers and lots of positive energy to Libby! Thank you! I found the fabric! Now, where might I find the pattern. I’m so sorry–I am new at this!